This issue is better than most, as it features some exposition for those who are COMPLETELY lost on this title’s current events. It might prove a decent jumping-on point for new readers, though if the past 20 issues are any indication, jumping on may prove disappointing. 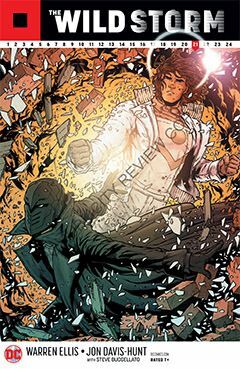 It is revealed the two super beings from last issue are Apollo and Midnighter, though there appearance is radically different from what I recall. New Universe version? New 52? I don’t know. But now the team of Jenny, Jack, Angie, et al are FINALLY making their alliance known, amidst a great deal of guilt and angst. I’m not used to seeing this much emotional overflow outside of the CW. That’s what the past 20 issues are all about, Charlie Brown. Twenty issues of two super-secret cabals circling one another like two schoolyard kids, each afraid to throw the first punch. Thankfully, the exposition is broken down into digestible pieces. And the sound bites keep coming, as Ellis shares other tidbits of information for the benefit of those who are thoroughly confused. Which suggests to me that this title is scheduled to run for several more issues before someone at DC has the good sense to pull the plug on this meandering, bloated project designed to feed the writer’’s ego. You’re free to disagree with me, and call me an unsophisticated philistine with no comprehension of A-R-T. Pardon me for saying it, but on the list of things comic books are, “art” is dead last. But if art is in the eye of the beholder, then comic books to me are entertainment, and this series fails to entertain me.